The best pictures we find are published as the picture of the month on the web site home page. Here you can view previous pictures. To see the picture at its best, click on the image for a larger picture. There may be the occasional gap where a picture was not published. 125 records found. Page 1 of 13 displayed. 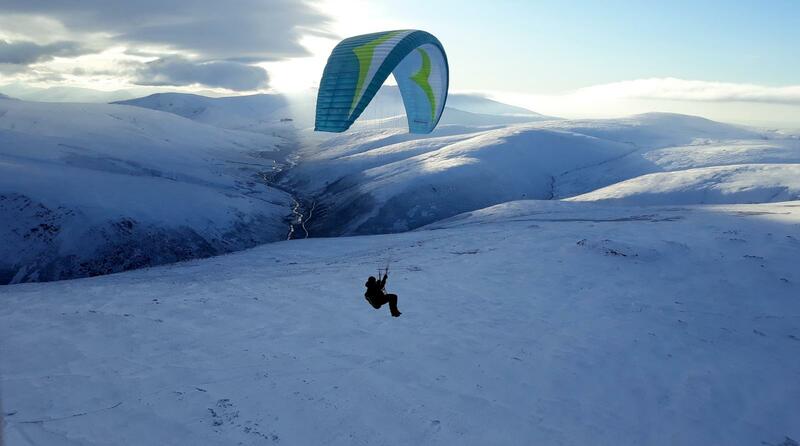 Malcolm and Rob Grout had some nice flying at Carrock Fell on Friday 1st February as no-one else was there!! When they arrived the wind was well off to the North at the bottom of Carrock and quite strong. It was rather more on the hill at cloud height. They decided to head to Sandbeds (just north of Carrock) for the northerly but there was no wind there. They then walked up High Pike where there was a light NNE straight up the spine. After making a tricky launch from the summit in snow they peeled off towards Carrock. Lift was found and they soared along the ridge where wave was encountered. A hazy wave cloud was forming at times above Carrock. It wasn't possible to get terribly high but conditions provided glass smooth, easy soaring. That was a good job as it was cold enough to require hands off (to keep warm) flying much of the time. A top landing and walk to Carrock summit was included for good measure. A great day out! Pilot is Rob Grout and photo by Malcolm Grout. Malcolm Grout reports that the last few days of 2018 provided some decent soaring at Bewaldeth, NW of Skiddaw. Although conditions were rather light low down, soaring was good higher up. We flew till it was just about still light enough to land 29 minutes after sunset! Pilot Gordie Oliver flying Gin Tribe. Photo Malcolm Grout. 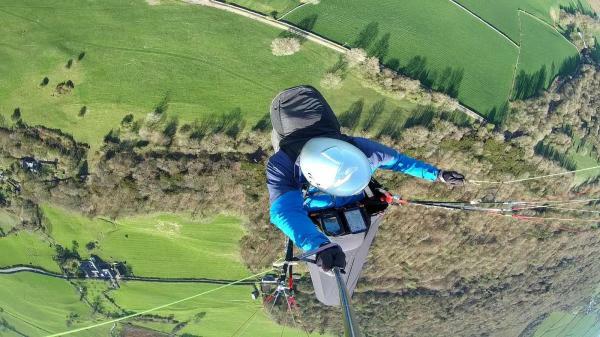 Malcom Grout reports that any flying we get this time of year is a bonus. 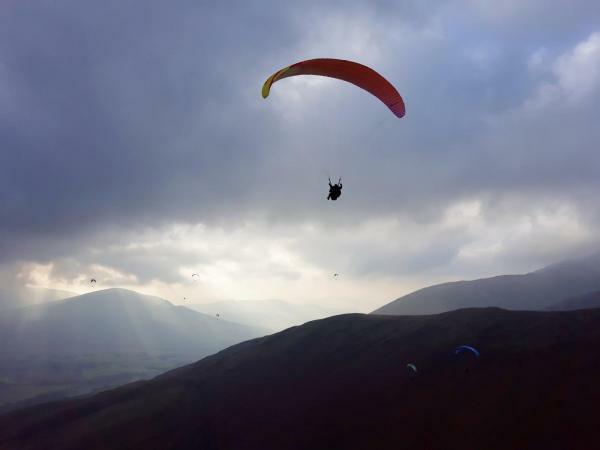 Friday 23 November made for very pleasant local soaring conditions at Souther Fell which is on the SE flank of Blencathra in the North Lakes. Cloud base was about 2000ft, lifting and clearing later to a beautiful autumn afternoon. Here's Chris Little and his passenger aboard his Sup Air Soarer tandem paraglider. The view is looking South west. Souther Fell is in the foreground and Clough Head is in the distance on the far left. On 6 October, Dave Ashcroft ran one his XC expeditions in the West Lakes. 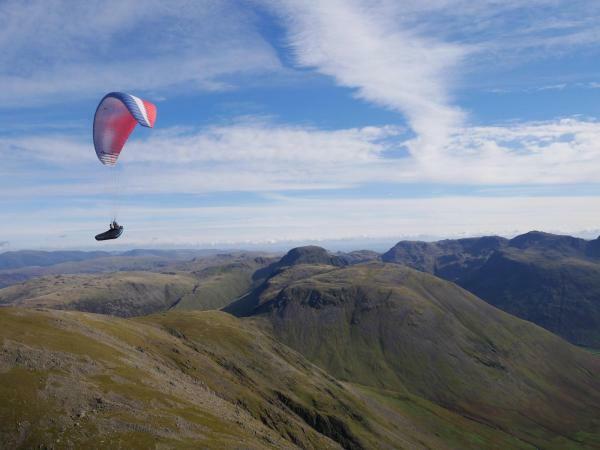 Dave says "7 turned up for the challenge to fly down Ennerdale to Great Gable and return along The Screes to cars planted at Santon Bridge earlier that morning. Conditions were good with a moderate wind, sunshine and plenty of thermals. Malcolm Grout lead the team and Dave stayed at the rear keeping count. Dave Armstrong and Liam Oliver landed within a mile, and the rest, incl. Tim Oliver, Harvey Foster and Dave Eva, made the goal." Kirk Fell is in the centre right, Great Gable is in the centre and the Scafell ridge is to the right. 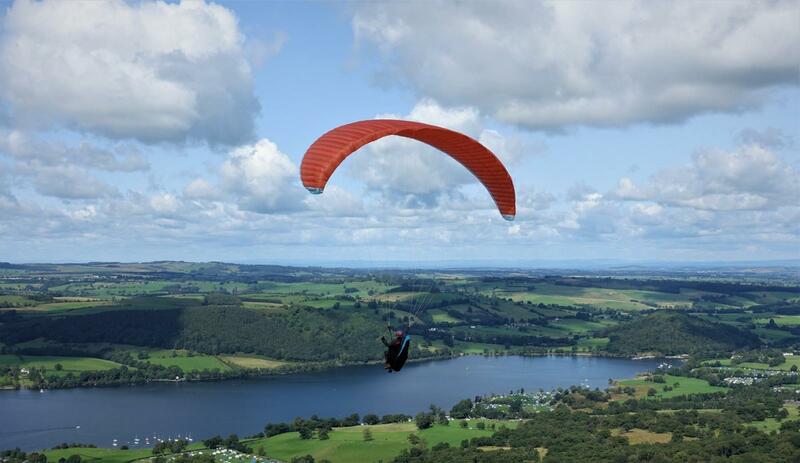 A superb place to fly! The last day in August provided some excellent if rather windy flying. 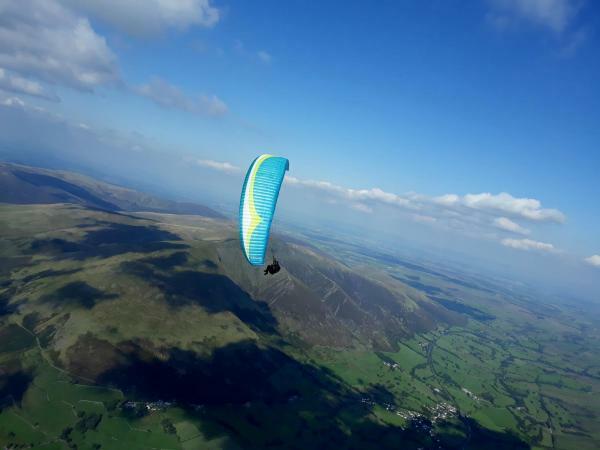 Macolm Grout took this photo of Rob Grout on his Gin Explorer over Jenkin Fell, on the southern slopes of Skiddaw, looking over to Blencthra. 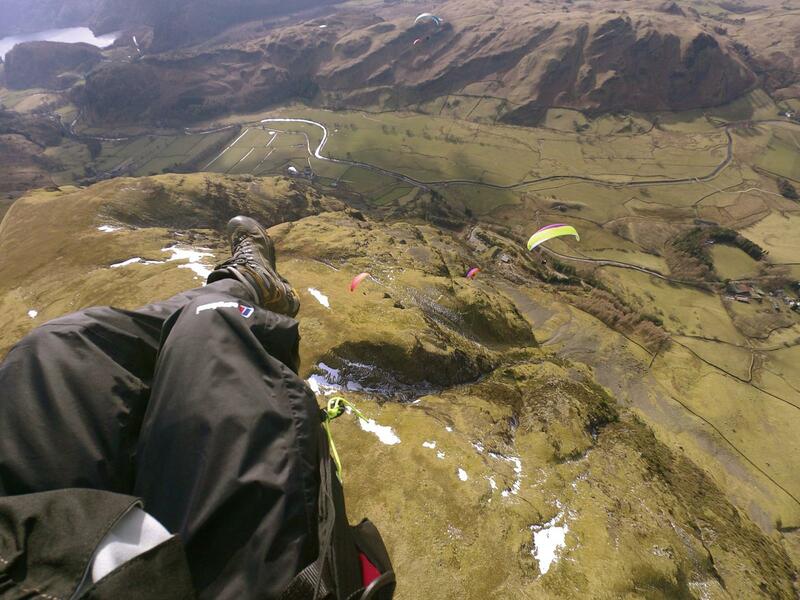 Malc reports that take off was on Blease Fell and progress into wind was very slow. 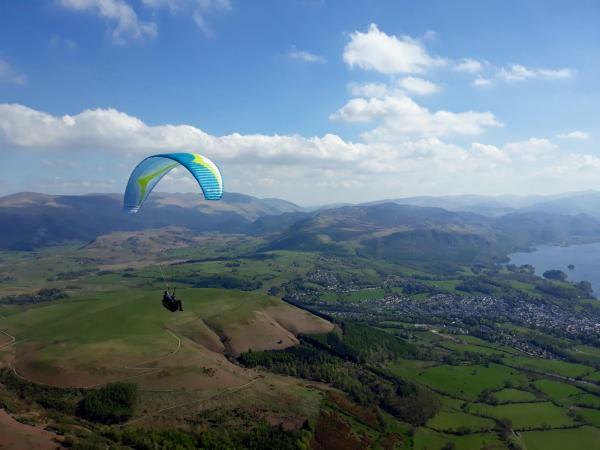 It was possible to fly to Souther Fell (on the eastern flank of Blencathra) and back and then on to Jenkin Fell. Flying in winter can be amazing! 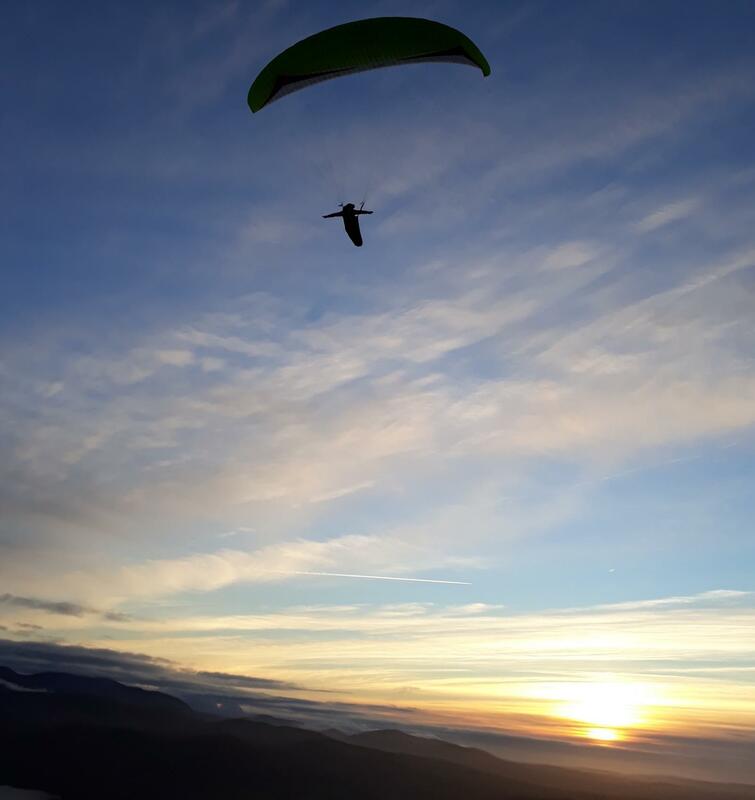 Ben Keayes took this photo on Great Dodd (north end of the Helvellyn range south of Clough Head) and reports " Al (from York) taking the first flight on his new wing from the summit of Great Dodd. 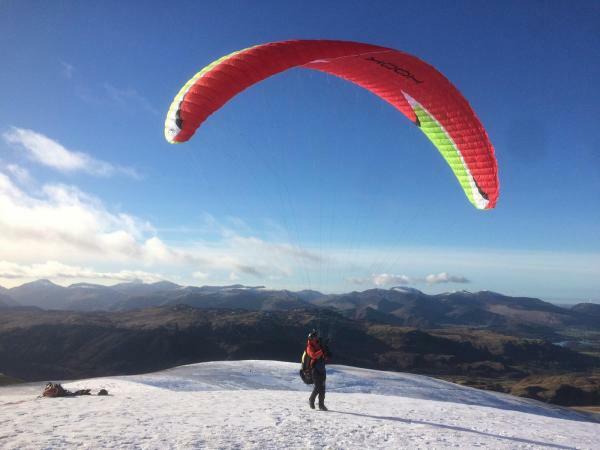 We walked up from Wolf Crags – he flew over the snow to land near St John’s in the Vale – and I did an exciting downwind dash back to the car... Fun was had by all!"